This case of 1,000 rounds is an excellent deal for those looking to get some trigger time with their .40 S&W pistol. 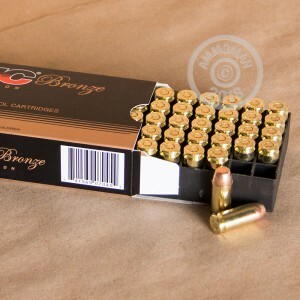 These cartridges use a typical 180 grain full metal jacket flat nosed bullet, non-corrosive Boxer primers, and reloadable brass case. A great practice load for your M&Ps, XDs, Browning Hi Powers, and Glocks. A relatively new entrant to the US shooting market, PMC Bronze ammo from South Korea has gained immense popularity due to its good performance, widespread availability, and low cost. Assembled by a major defense contractor using internally sourced components, it undergoes extensive quality control measures to ensure that every box delivers a consistent shooting experience. Spend more than $99 at AmmoMan.com and we'll throw in free shipping--a big cost saver on ammunition orders. Good ammo for range use and received order in about a week. No Jams, clean powder and very accurate. I'm buying another 1,000 rounds today. You get what you pay for. Product arived very quick and the ammo was exactly what i ordered just like always. I have used PMC in many calibers and not one problem. It is my ammo of choice. 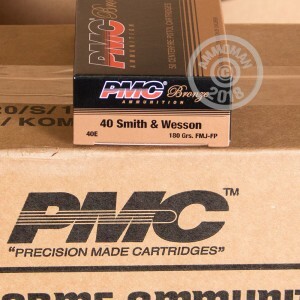 Ammo man has the great service and PMC has a great product. 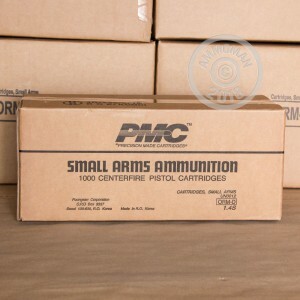 PMC 40S&W...good ammo to begin with. Ammoman's price, and prompt delivery were unbeatable. You earned yourself a lot of my customer loyalty.